Kris after being promoted to Sergeant while serving in Afghanistan. “I’m not kidding, the first semester was hard, really hard,” Kris says. “Community college is definitely not fluff,” she reiterates. Kris is totally emphatic about this point, which is an impressive statement coming from somebody with her life experience. Three and a half months after the September 11th terrorist attacks, Kristine Purcell joined the Army Reserves and later became a Military Police officer. After basic training, Kris was deployed for 12 months to Guantanamo Bay where she spent her 20th birthday. Her record of service also includes a 10 month deployment to Afghanistan in 2012, and a 2014 deployment to Oman, Iraq, and Kuwait, all on a voluntary basis. It deserves to be explicitly noted: Kris Purcell is a badass. Stateside, Kris has served as a member of the Tennessee National Guard Counterdrug Task Force, focusing on drug demand reduction with at-risk youth. “You don’t expect to make a change in their lives, but when you can change something for one person, that’s enough,” she says. Kris knows what it’s like for somebody to reach out with support and encouragement to make an investment in her future. Years after graduating from high school, a friendship with a former English teacher put Kris on the road to continuing her education. Athletics were Kris’s top focus in high school. 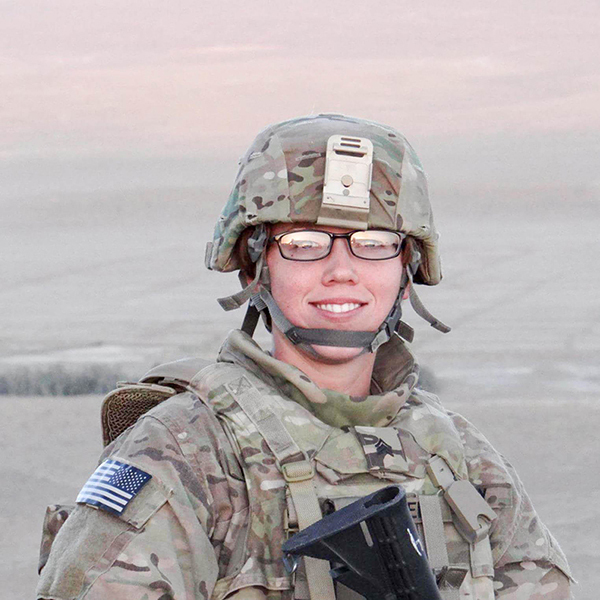 “I was not the individual who did the ACT or SAT; my ASVAB score was okay,” she admits. That former English teacher, Kris Prescott, urged her to go to college and immerse herself in the student experience. 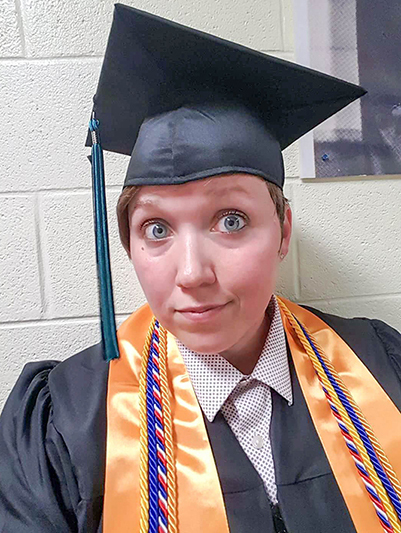 Kris applied to four-year universities in Tennessee, but even with 100% of her GI Bill benefits guaranteed, she was denied admission. Despite being turned away from other institutions, Kris grew even more tenacious about going to college. That’s when she decided that Nashville State could help her achieve her goal. Kris graduated from Nashville State with an AS degree in Political Science on May 9th, 2017. Within a few hours Kris was enrolled as a full-time student at Nashville State. The sense of discipline inherent in her National Guard position also served Kris in the classroom. “Professors aren’t going to change for you, you need to change for them,” she shares regarding her heavy workload of classes. In her first semester at NSCC, Kris organized a study group for herself and her Philosophy classmates to ensure their mutual success. Kris also continually credits her teachers and academic adviser Emily Bush for helping her make the best choices to secure her academic progress. “They want to help… They’re profoundly and passionately committed to the students here,” she adds. “I have aspirations for my future, they’re attainable, but vague,” Kris answers when asked about her long term goals. She adds that she would love to end up working for the State Department or the VA in the future. Kris completed her Associate of Science degree in Political Science this spring and will continue as a student in Political Science and Legal Studies at Belmont University this fall. “I never thought I was intelligent. It’s easier to not try at something and fail than it is to try and still fail,” Kris explains. “Nobody here wants you to fail. Be open to the idea of success. Work toward what you think you can’t do, and don’t fear the unknown,” she advises. says, and she’s one of those people, too. “I wasn’t a perfect kid. I want to give back, and I want to do right,” she says. Kris has proved the sincerity of that desire with her history of service to her country and her community. Her goals for a future of service also prove that Kris lives those words to the fullest possible extent.